Online document creation is nothing new, but legally binding digital signing of those documents is, holding a promise of new levels of efficiency in the relationship between lawyers and their clients. Auckland District Law Society (ADLS) announced the introduction of digital signing to its WebForms platform, creating online document documents for many widely used legal forms, including agreements for sale and purchase of real estate and commercial deeds of lease. Non-ADLS documents can also be loaded into WebForms to be digitally signed using the technology, which came from New Zealand cloud-based provider Secured Signing. Judge David Harvey, director of the Centre for ICT Law at the University of Auckland, said the legal profession like many others is facing digital disruption. Many legal processes are similar and these can be automated. Indeed, this is already happening in the new field of "legal expert systems". Also, and as in the case of many other professions, digital disruption creates opportunities for legal professionals to focus more on more bespoke and individual work, Judge Harvey said. Some will help create legal expert systems, deploy them online and, maybe, "make money while they sleep". Harvey said there are a lot of emerging technologies now poised to make an impact on the profession, from blockchain to artificail intelligence and more. Local law firm Minter Ellison is already involved in a joint venture to build a legal AI company, he said. "Law has an enormous data set and is very amenable to that sort of process," Harvey said. But digital signing isn't a new idea - it has been provided for in several Acts of Parliament going back to 2002. "What has become apparent is the technology has caught up with the law - which is very unusual," he said. "Law is usually decades behind." ADLS’ WebForms are used by over 1000 law firms, enabling even more thousands of legal professionals to customise legal forms using over 100 templates. And as of November, these documents can be signed digitally. The WebForms platform offers customised workflows designed with lawyers and their clients in mind. However, the technology behind it may well have applications in other sectors. As a result, users now have options for real-time, online verification of identity, using NZ Post's RealMe, a NZ Passport and a NZ Drivers licence. But how do you know it's authentic? Well, a log captures all signing interactions, and provides an audit trail of the process and a PKI digital certificate seals the document and its signatures. The platform also allows a digital signature to be digitally witnessed with planned features including the ability to digitally negotiate and countersign a document. Tim Jones, former convener of ADLS’ documents and precedents committee, said having the right checks and balances in place makes this platform the pre-eminent version in the market. “It needed an organisation like ADLS to enable digital signing of legal forms, so that people can be confident using it - and now it’s here," he said. "Because ADLS has done so much work on this, lawyers and their clients can be confident it’s a secure product." Face-to-face meetings with clients will always be important, said Joanna Pidgeon, president of ADLS. "But, as people’s lives become busier and traffic gets heavier, digital signing will mean increasing efficiency for the document signing process, more convenience and also cost effectiveness," he added. “Documents no longer have to be couriered across town or to different parts of the country for signing – it can be done anywhere, at any time, on any internet-connected device including mobile." A comprehensive education programme including an on-demand video, an online user guide, a practice notes and protocols document, and one-on-one demonstrations to law firms is planned to educate users on how best to use digital signing on WebForms. Because according to Judge Harvey, digital disruption is no bad thing. "People shouldn't be afraid of it," he added. "There is an opportunity to transform." The trouble is, when people have been doing things the same way for years, disruption causes discomfort and generates "pushback". 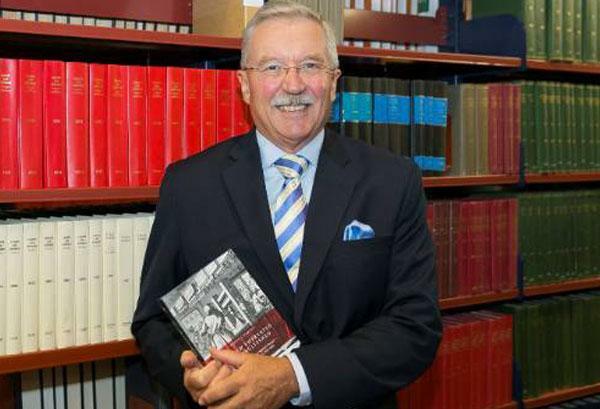 In his researrch role Judge Harvey has been studying other emerging disruptions such as online dispute resolution and assistance for self-represented litigants.